It's official - we're going cloth! I have done about 20 hours of research online, in stores, and talking to moms about diapers. I compared cloth diapers versus a cloth diaper service versus disposible diapers. At the end of the day, cloth won by a landslide! The factors I considered were cost, convenience, cleanliness, and overall sanity. 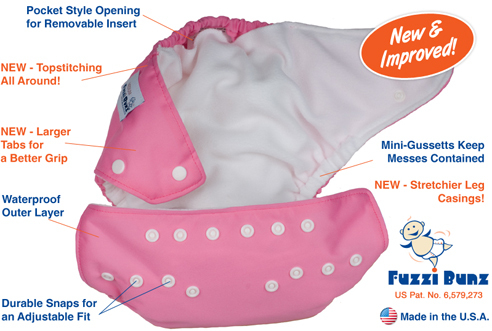 The newer cloth diapers that are on the market are amazing!! 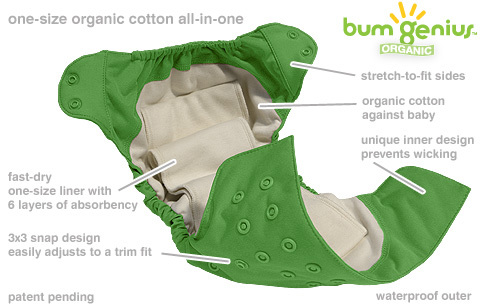 These ain't yo mama's diapers; these are state of the art, completely washable, and adorable. Take a gander at Bum Genius or Apple Cheeks for some adorable examples (and there are many more different models and versions with velcro, snaps, both, etc). After my 3 years of nannying 3 very active boys (and potty training two of them), I have seen my fair share of poop. I have washed my fair share of soiled clothes in the toilet. I have seen many a blow out at the most inconvenient times. Poop doesn't scare me. Vomit doesn't scare me. Both combined in a giant blow-out doesn't scare me. It happens. I'm not intimidated by the thought of changing and washing diapers so that didn't really play a big factor in the decision to go cloth versus a diaper service. It saves money to just do it ourselves. Poop is poop. In terms of using them, after a cloth diaper has served its purpose there is a toilet attachment that washes the baby droppings into the toilet so all that's left is machine washable. You throw it all in together and voila! They are ready to go for their second, third, or hundreth time. My friend just finished baking her 4th kid and is still on her first set of Bum Genius diapers. The most beautiful part is you pay for the system once (roughly $400 - $700, depending on how many bells and whistles you want) and you don't have to spend $2,500 per kid for diapers! So if you have 4 kids like my friend, you would spend $10,000 on disposible diapers alone. $10,000!!! Kids are expensive enough. I would much rather put that money into a high interest CD and put them through college. As an added bonus, kids who are cloth diapered are easier to potty train because they can feel when they wet themselves. This means a few more changings in the beginning but will lead to a potty trained child sooner. Plus, the diapers you change won't be bursting at the seams like a disposible that doesn't let the child know when they go. I love saving money, I love not having to go out in the middle of the night for diapers, I love being able to use something for all the kiddos, and I especially love the cloth community that I've encountered in this research. It's not full of hippie mamas who are stickin' it to the man - it's a community of practical moms who stick together. Awesome blog girl! I can't stop reading, lol. I'm glad you guys are going cloth, it's something I want to go with too (way) down the road. But anyway, I babysat for a woman with twin boys this past semester and she hand-sews cloth diapers. Check out her blog, you might be interested in buying some from her. Poke around her blog for more info on them. Blessings!